Tag line: "If you see him... Run"
Scott (Jon Foster) is planning to shoot a nature documentary, and convinces his wife Penny (Sarah Jones) to move out to the country with him, where they’ll spend a year living in an isolated cabin. A few weeks in, though, Scott realizes his film has no focus, and begins to lose interest in the project. Then, one day, while he’s out shooting in the woods, Scott’s backpack is stolen by a mysterious stranger, who quickly retreats to a nearby house. When Scott and Penny sneak into this house to retrieve it, they make a startling discovery: the man who lives there is none other than Mr. Jones, a recluse whose unique scarecrows took the art world by storm in the 1970s. Excited that they’re the only two people in the world who’ve seen him in the flesh, Penny talks Scott into abandoning his nature movie to instead shoot a documentary about Mr. Jones. But a follow-up trip to Mr. Jones’ house causes them to realize his scarecrows serve a greater purpose, and by dabbling in things they shouldn’t have, the couple has unleashed a force that threatens both their lives and the well-being of the entire planet. 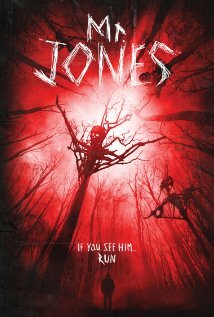 Released in 2013, Mr. Jones is a unique entry in the found footage subgenre in that it doesn’t limit itself to the conventions of that format. First off, the film occasionally has Scott act as narrator, to clue us in on what’s going through his mind (early on, he laments the fact he dragged his wife into the woods for a movie he no longer wants to make). In addition, the movie seldom worries about justifying why the camera is always running (some scenes, especially one set in a bedroom at night, are framed in such a way that we don’t even know where the camera could have possibly been placed). Most interesting of all, though, is the final act, at which point Scott and Penny find themselves trapped in a nightmare where they’re both the observers and the observed. After seeing dozens of these movies try to explain why their footage exists in the first place, it was nice to experience one that wants you to simply accept it on its own terms, with no questions asked. Though the movie does flounder towards the end, when jarring cuts and excessive shaky cam are the rule as opposed to the exception, Mr. Jones is an engaging, sometimes creepy film that deserves points for setting itself apart from the rest. Dang. This looks pretty good. I need to search it out. Looks like something I'd really like to see.